Another moving day today - it started grey, overcast and misty but not really any rain. We had only got about 20 miles to travel from Dolgellau to Bala, so on the way we decided to stop off at Llanelltyd to do the Precipice Walk. 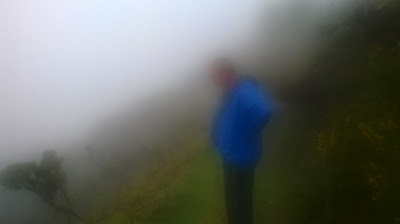 If you search for it on Tripadvisor it gives it 5 stars, and it may well have been a lovely walk, but it was so misty I think we missed most of the spectacular views!. John at about 10 yards! We continued on to Lake Bala and found Tyn Cornel concentration camp - whoops, sorry, I mean camp site. To be fair, the surroundings are really quite pleasant but the number of signs telling us what to do and what not to do are over the top. We are pitched beside the raging river Afon Tryweryn, that is home to Canolfan Tryweryn (National White Water Centre), and from our van our views are of low hills and open country side. We soon learnt that the signs were not the only authoritarian way in which the camp site is managed - when we noticed the resident warden, who we christened 'The Camp Commandant' marching up and down watching over us like a shepherd watching over his flock. Once settled in we had a lazy afternoon in the van and kept 'The Commandant' happy by not straying very far. PS the site is up for sale for £600,000 if anyone is interested! Today we decided to cycle down to Bala and around the Lake. Unfortunately, because it is Bank Holiday weekend it was very busy, and the only way down to the town is down the main A4212 where large vehicles whistled by at alarming speed. The town of Bala was also chocka, but eventually we managed to fight our way through and exited onto the A494 where we found a shared path that runs between the road and the lake down as far as Glan-Llyn Centre. From here on we were back on the road but it was only a short distance till we left the main road and joined the much quieter B4403 which took us around the bottom of the lake to start our return journey back to Bala. As the road climbed up we crossed a little bridge - Pont y Pandy - We thought this was where Fireman Sam lived but if he does he must have been out in his little red fire truck!! However, we weren't disappointed with our ride because the the views were quite spectacular and on reaching the top of the hill we found ourselves overlooking a small Railway - Bala Lake Railway where little trains chugged in and out of the station. Is that a train or is it a bonfire! We trundled on a bit further and then had a coffee stop at Llangower Point where there is a nice little beach. And from there our journey continued until we stopped at the north end of Bala for lunch before nipping into town to pick up additional provisions for tea. By this time it was about 2.30 and the streets were thronged with pedestrians and traffic - thus making it impossible to cycle so we ended up strolling with the rest of the crowds. We then had about 4 miles to get back to the camp site, mostly over gently rising terrain so it was a nice easy ride of around 18 miles in total. We set off this morning to see the White Water Rafting and this was easy to access because there is a gate at the top end of the camp site which follows the river Tryweryn up to a dam and passes by the Rafting centre. It was interesting to see the canoeists and the rafters tackling the difficult looking technical stages and weirs, and at least while we were watching, nobody fell in! It all looked very exciting but it definitely wouldn't be for me - I don't even like getting my face wet in the shower! We followed the path as far as the dam and passed hundreds of canoeists and rafters readying themselves to take the plunge! But then having seen all that was on offer, and as the day was still young, we decided to take a short walk up into the hills in search of a small waterfall that we had read about. This turned out to be more of an adventure than we'd planned, and I think I will christen it 'The walk of Lost Paths'! To start with the path was easy to follow but after passing through a gate and under the electricity grid lines all evidence of a trail vanished and we had to take repeated grid references using both phone app and ipad maps to roughly plot where we were and where we should be, and unfortunately, we got it wrong. We ended up trekking through a dark dark wood (pine forest), which wasn't marked on the map, but where there was a clear path that looked as if no one else had ventured there for a very long time. John in the dark dark wood! When we got to the other side we climbed over a style, but after that the trail just vanished again, and as there was only a boggy field in front of us we had little idea of where to go next. Eventually John figured out, by using his phone and ipad, that we had gone wrong and needed to back track back through the dark dark wood (spooky and no mouse found). After retracing our steps we eventually found what we were looking for - a foot bridge over the little River Hesgyn and this became our chosen picnic spot for today. Following our refreshments we proceeded on our way, again trying to follow deteriorating or non existent paths and having to rely on the map to guide us. The only evidence of footfall was from animals (mainly sheep), and in places the ground underfoot was waterlogged, which resulted in us having to find detours to avoid the worst of it. This situation continued until we eventually reached the little lane from where we had started. We never did find the waterfall and the walk itself was a navigational challenge, which John managed very well. In our opinion Bala and it's surrounding areas are a lovely place, but probably better suited to people who like water sports. There seemed very little for walkers and the only cycling we found required inclusion of long sections of main road and steep hills.